Service Untitled» Blog Archive » Does America run on “Dunkin’ Donuts”? Does America run on “Dunkin’ Donuts”? Brands Keys Customer Loyalty Engagement Index sets Dunkin’ Donuts as number one in customer loyalty for the coffee category. Second only to oil production, coffee is the largest commodity sold. The coffee category included ratings on consumer preferences, the consistency of meeting customer expectations for taste, quality, service, and brand value. This is the sixth year in a row the quick food coffee shop has been recognized with the award. Dunkin’ Donuts has more than 7,000 restaurants in the United States and District of Columbia and another 10,000 restaurants in 33 countries. Their products are also sold in grocery stores and other specialty shops thus giving them a much broader shot at international brand recognition through a larger variety of different venues. So what makes “Ameica Runs on Dunkin'” so popular? Most Dunkin’ Donuts are franchises, and their core values include honesty, transparency, humility, integrity, respect, fairness, and responsibility. Franchise applicants are required to have liquid assets of $250k and a net worth of $500k. Experts in the field provide extensive learning and training opportunities. Much of the organization’s success has been attributed to the dedication of the franchises and their ability to create an outstanding customer experience. Perhaps the hardest part of meeting customer expectations however, lies with brand value and delivering the product to customers to make them happy. Actually the superior guest experience happens when customer expectations are exceeded. The company’s Dunkin’ Donuts Perk and Rewards program translates into free beverages as well as emails informing customers of the latest news, special offers and new store openings. Every year a participant receives a free medium beverage on their birthday. People remember – and couple the marketing with fast service, a smile from the person behind the counter, and 100 percent Arabica coffee beans, a recipe for success seems to have been achieved. You may be a loyal fan of Starbucks where customers contemplate a more comfortable setting, a wider array of coffees, frappucinos and smoothies, having an employee inscribe your name on the cup and that small convenient table for sugar and spice – but “America Runs on Dunkin’ ” is less expensive and still makes the consumer feel as if they are appreciated. In a company that serves more than one billion cups of hot coffee and iced tea annually, clever marketing has made people feel more engaged. The company’s green policy began in 2008 when the first green store opened in St. Petersburg, Florida, and on January 20, the second green store opened in St. Petersburg using eco-friendly LED lighting, recycled water for landscaping, coffee grounds for area farmer composting and even an electric car charging station. The company supports veterans and donates coffee to the USO and provides grants for the welfare of the hungry. Since it’s introduction, Dunkin’ Donuts never failed to delight customers not only in America but for it’s international franchises as well – offering affordable coffee to everyone. Despite lifestyle shifts caused by economic downturns, still, we are able to afford the comforts of having hot drinks away from the usual home brewing. 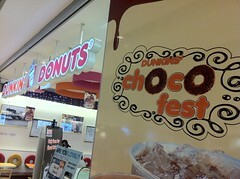 Indeed, thanks to Dunkin’ Donuts!